Mary Murray felt betrayed, and Mike felt desperate and suicidal. That’s when God stepped in. Mike felt restless, unsettled, empty. But he didn’t say anything to Mary. With a 2-year-old daughter, Brittany, and a 6-month old son, Eric, the Murrays didn’t take time for heart-to-heart conversations anymore. They couldn’t just pick up and go places whenever they wanted to. Mike didn’t like that; he felt trapped. He never had time to do what he wanted to do. He often spent 60 hours a week at the office, and that’s where he struck up a friendship with a female colleague. “We went out to lunch, talked,” Mike says, “… she was separated, going through hard times.” With no young children vying for his attention, he was able to listen. And she listened to Mike. And it wasn’t long before their relationship escalated into a sexual affair. Like any unfaithful husband, Mike created a web of lies to cover his infidelity. All the while, Mary was unsuspecting. She never questioned why her husband was gone so much. She was busy with the kids and trusted him. They had been best friends since high school and the thought of Mike being unfaithful had never crossed her mind. Mike became more and more emotionally distant. He and Mary were spinning in opposite directions, and they seldom talked. Mary began wondering if there was another woman. What was Mike doing to his family? Where could he and Mary go for help? And how bad would things get? Although the Murrays had never attended church as a couple, Mike had been raised in church. He felt they needed spiritual help, so they sought counsel from Pastor Jeff Green at Sutton Baptist Church in Sutton, Vermont. After hearing their story, Pastor Green asked the Murrays about their relationship with God. Mike explained that he had said a prayer of faith as a child. Then the pastor asked him if he would totally commit his life to the Lord. Mike said he would, but again he was lying. At this point, he wasn’t actually sure if he wanted to give up the other woman. Next the pastor asked Mary about her faith. She wondered why he was asking her this question. Wasn’t Mike the one who had messed up? After the Murrays returned home, the pastor’s words echoed in Mary’s mind. Then, a few days after meeting with Pastor Green, she recognized the sin in her own life and made a decision to become a follower of Jesus Christ. That’s when things started to really change for her. Several weeks after meeting with Pastor Green, Mike came to an unexpected crossroads. His girlfriend told him she was pregnant. He realized he had made a real mess of his life. Mike Murray had finally come to the end of himself. He confessed his years of lying and deceit to God and gave the mess he had made to Jesus Christ. “God spoke to me, and instead of receiving Christ I gave my life to Him,” Mike says. But now he had to face Mary. At the same time, God was working in Mary’s heart about forgiveness. And one day she unexpectedly told Mike that she had forgiven him for his inappropriate friendship with his co-worker. But Mike could not lie to her any longer. Now a follower of Christ, he began to weep. He confessed that the affair had been not only emotional, but also sexual. Despite her doubts, God continued to work in her life. She hung onto His faithfulness (1 Corinthians 10:13b) and asked God to give her the strength to forgive her husband. For Mike the pain of admitting his lies began a journey of truth he has never regretted. First, he started to rebuild trust with his wife by being right with God. Mary needed to see Mike following hard after God instead of being the person he used to be. He started bringing his Bible to work, reading it during lunch, and doing his best to follow its teachings. And for the first time in their married life, the Murray family became part of a church. 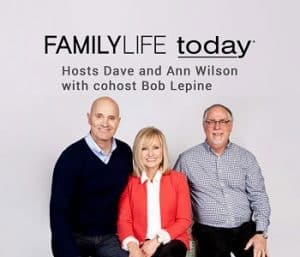 About the same time the Murrays’ pastor saw an ad in the newspaper inviting people to attend a HomeBuilders Couples Series® study, FamilyLife’s small-group study for couples (now called Art of Marriage Connect). He encouraged them to join the study. Having nothing to lose at that point, they agreed to give it a try. 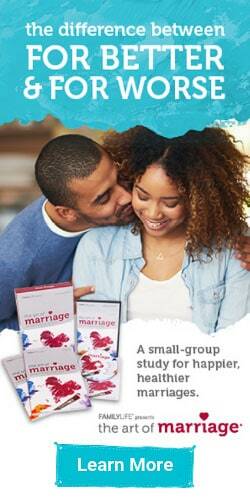 As they went through their first small-group study, Building Your Marriage, they discovered God’s way of doing marriage. And answering the homework questions gave them a real opportunity for their own marriage to grow. “If we could apply these things, our marriage would work,” Mike says. After going through Building Your Marriage, the Murrays began leading couples through it. They eventually led more than 20 Art of Marriage Connect groups in New England and helped start groups at other churches in the Northeast. They also attended many of FamilyLife’s Weekend to Remember® marriage getaways. Every time they went to a getaway they were in a different season of life or in a different place in their marriage. So every time they went they got something new out of it. Then in 2007 Mike became pastor of the Catalyst Church in Jericho, Vermont, where he serves today with his wife. They have led two of The Art of Marriage® video events there and continue to tell others what God has done in their marriage. Although it’s been more than 25 years since Mike had the sexual affair, he still feels some pain when he remembers it. “She told me that she got an abortion,” he says. “It is something that I have had to deal with. The Scripture teaches us that we are forgiven but the consequences sometimes remain.” But today he’s grateful for the decision he made at that crossroads: that he would surrender his life to Jesus Christ rather than ending it to get out of his misery. And Mary is not the only one who is thankful. Their daughter Brittany didn’t think much about her parents’ reconciliation until she married seven years ago. Her husband came from a broken home. “I see what life could have been like if my own parents had gotten a divorce,” she says. Like most young couples, Brittany and her husband have had some marriage struggles. And sometimes they have sought counsel from Mike and Mary. Why? Because they have witnessed the difference God has made in their marriage. Brittany’s younger brother, Eric, agrees. “When most of my friends were losing their family structure, mine held together,” he says. “Even now, our family gets together most Sundays after church and spends time together. Co-workers and friends mostly don’t understand this, or how it happens. But it shows the importance of a strong family in a crumbling world. It’s ironic, but when Mike gave God the rights to his life, he found what he had been searching for. When he surrendered his life and marriage to Jesus Christ, he discovered the source of true joy and contentment.